"Whoaaa," said a child as he walked through the doors around noon. His eyes widened and he picked up his pace at the sight of Connected Worlds, a series of stunning landscapes projected on giant walls at the New York Hall of Science in Queens. The light from the 3,000-square-foot installation illuminated his face in hues of green and blue. At the center of the room, surrounded by screens, a couple dozen kids ran from one magical habitat to another, chasing fantastical creatures and digital streams in the interactive space. The vibrant illustrations on the screens matched, and sometimes exceeded, the beauty of the worlds they simulated. The technology that powered them was hidden from the children on the floor, yet visible overhead in the high-ceiling room. 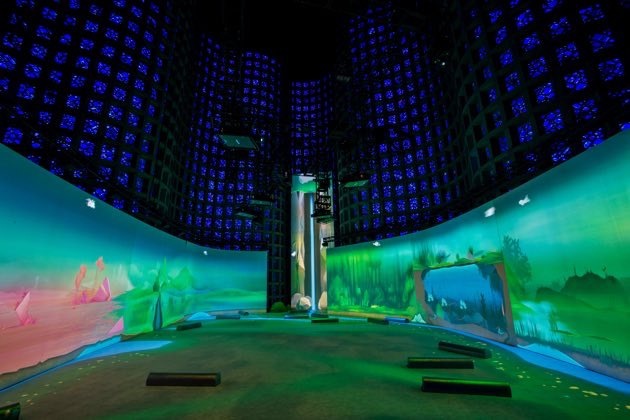 Eight projectors created six different biomes and a 40-foot-high virtual waterfall on blank screens. A dozen Kinect cameras, suspended in midair, brought those visuals to life. The habitat has been carefully designed to respond to hand movements; even swift karate chops were promptly picked up. There was a constant give and take between the children and the machines. Every time a child held his or her arm out in front of the screen, the body-tracking device picked up the movement and the system responded with a seed that twirled inside a translucent bubble. When the little hands dropped down, the simulated seed followed and fell to the ground. Within seconds, a plant sprouted in its place. With every successive seed, the ecosystem was programmed to introduce complex flora that started to thrive when watered by the digital streams. The exhibition, which is now permanently installed in the museum, has been in the making for the last three years. To educate and entertain the science enthusiasts who squeal through the halls of the museum in delight, the creators adopted a systems-thinking approach to sustainability. "We're providing a space that has a fixed amount of resource, which is water," says Theo Watson, co-founder of Design I/O, the creative studio from Cambridge, Massachusetts, that created the interactive exhibition. "No water is ever created or destroyed; it's just moved from one environment to the next or back to the waterfall." Most kids busied themselves with the "logs" that could be used to route the virtual streams on the floor. While some destructively blocked the waterfall, others created perfect little streams for their biomes. But with a fixed resource, one habitat was often left too dry while another was booming. As a last resort, the kids had the option to drain a reservoir to get more water, but not without feeling the intended repercussions of it. "We want it to feel like a sacrifice," Watson says. "They're having to destroy one environment in order to save others." The sustainability message wasn't for every child, though. There were toddlers in the group who rolled on the floor, shooed fish on the walls or just lay on the logs. But for the kids who did engage with the environment, there seemed to be a takeaway that isn't found in the real world. They could take charge of the biomes and see the impact of creating and destroying elements almost instantly. "With sustainability, we realized that you often don't see the result of your actions," says Watson. "You're separated not only by time, but also by space." The virtual ecosystem is ingeniously programmed to accelerate that feedback in time and the effects of every action become visible on the projection walls. Technology is often denounced for disconnecting us from nature and from each other. But Connected Worlds attempts to redefine that equation. "We're obsessed with nature," says Watson. "We can't help but see algorithms in natural systems. When we're working on something like [this], we're paying homage to nature and using technology to do that in a way that's meaningful to us. We pingpong between being in love with technology and being sick of it at the same time."